Revo iBlik Radiostation review | What Hi-Fi? Revo announced itself to the radio market this year with the Blik Radiostation – at the time of launch, the world's first DAB and Internet radio. 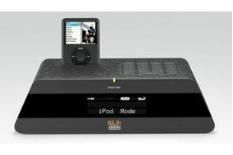 Now we have an enhanced version, the iBlik, which, as you've probably guessed, includes an iPod dock. Perhaps the most compact unit here, the iBlik is a surprisingly lightweight yet still solidly built machine. A clear LCD on the front of the screen is complemented by buttons on top of the screen and an easy to use remote, while the interface and navigation system is fine if, in line with most Internet radios bar the Pure, far from efficient. The dock works well, with the remote offering full control.